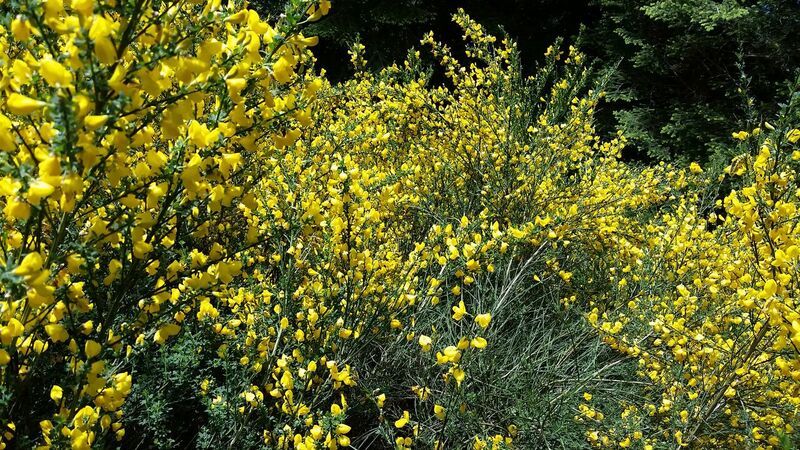 The resilient and invasive Scotch broom (Cytisus scoparius) is back in full force this season, with flowers quickly coming into bloom in disturbed sunny sites across the island. Distinguished by its bright yellow flowers and woody stem, the perennial plant can have up to 3500 seed pods per individual, which when released, can travel up to 5 meters, helping them to spread and survive. 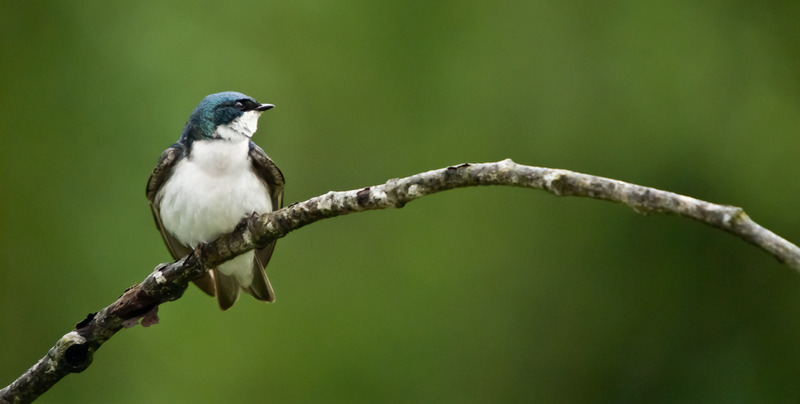 Although beautiful, the introduced species out-competes vulnerable native species, alters ecosystems, and is a fire risk. 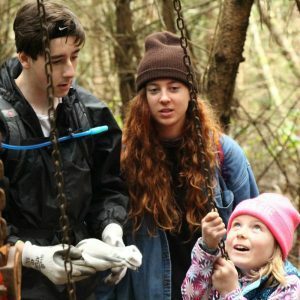 The Galiano Conservancy works actively, especially in late spring, to remove plants that are blooming and coming to seed, in order to reduce problems associated with the plant and to hinder their prevalence in coming years. 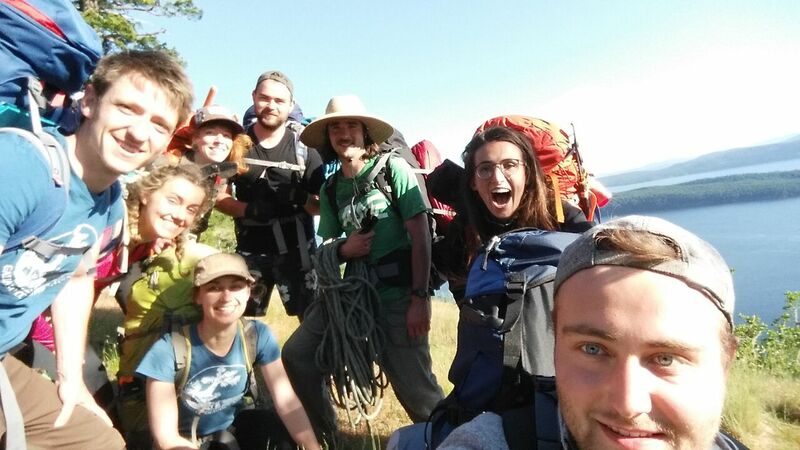 Recently a team of summer students and German interns were led by Galiano Conservancy full time staff on a trip up Mt. Sutil for the purpose of targeted broom removal (and a little fun). 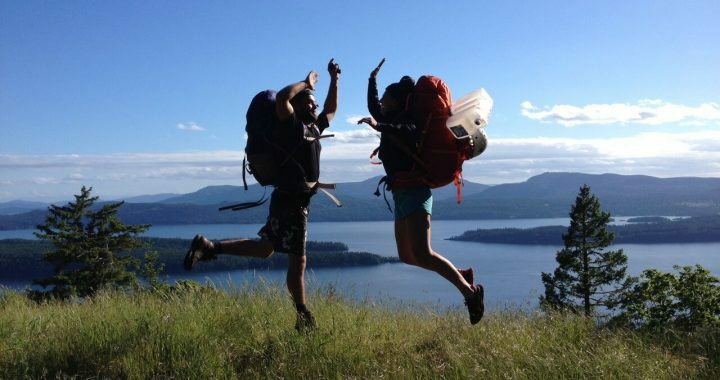 The team of eight started their journey by kayaking to the base of the 290-meter Mt. Sutil. Loaded with broom removal gear and camping supplies, the team made the ascent up to the top, while taking breaks to remove the species whereever the bright yellow flowers were spotted. Once we reached the summit, we set up camp and located ideal broom habitats. Over the next two days the team, armed with loppers, ropes, harnesses and lots of determination, removed hundreds of scotch broom plants from Mt. Sutil’s unique ecosystem. Stems with a diameter smaller than a pencil were removed through by pulling, while larger flowering plants were removed at the base of the stem with loppers. Removed species were piled and left in shady dark areas – an effective method to ensure that seed release cannot be initiated by sunlight. Another effective method is to place the plant in a tied black plastic bag and leave in the sunlight. Why all this effort to remove the pesky plant from this patch of land? With roughly 40 acres atop Mt. Sutil owned by the Galiano Conservancy, we feel a responsibility to ensure that the fragile and unique ecosystem found here is supported. 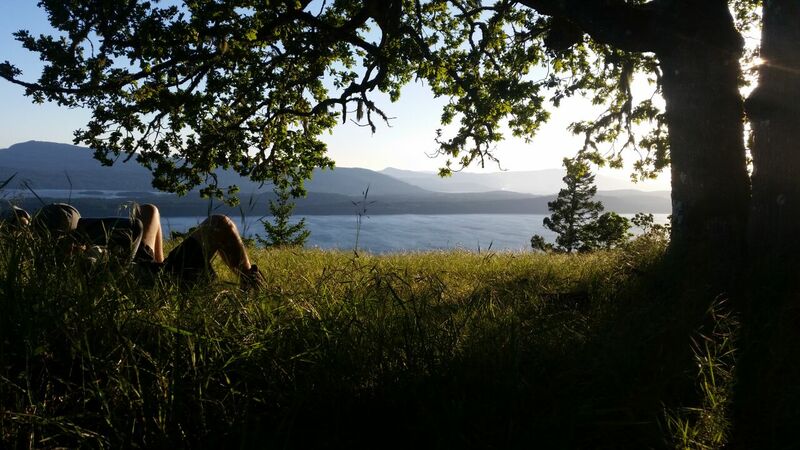 Recognized as a relatively unaltered Garry Oak ecosystem, the area is home to rare plants and grass communities, such as common camas (Camassia quamash), death camas (Zigadenus venenosus) and Roemer’s fescue (Festuca roemeri), as well as the previously mentioned Garry oak tree. The Conservancy and the enthusiastic team of summer students hope to continue broom removal on this site, and others across the island, into the summer, and in years ahead. In the mean time, each team member has specific tasks for the upcoming months. 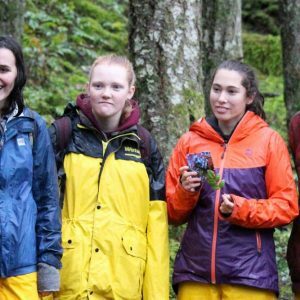 Rhia: Summer Student From: East and west coasts of Canada Area of Study: forest biology and restoration of natural systems Where: University of Victoria. 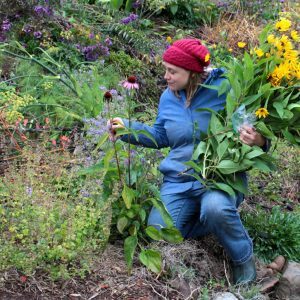 Role at the Conservancy: Restoration technician but also permaculturing it up in the forest garden, and helping with the education programs when needed. This is a dream job for me and I am loving every bit of it! Alexander: Summer Student From: Delta, B.C. Area of Study: Environmental Studies and Geography Where: University of Victoria Role at the Conservancy: Permaculture Technician Interests: Skiing, surfing, outdoors, hiking and gardening Clemens: Intern From: Saxony Anhalt and currently living in Freising Area of Study: Forestry Engineering Where: University of Applied Science Weihenstephan-Triesdorf (HSWT) Interests: hiking, traveling, biking, nature Role at the Conservancy: Helping everyone who needs it, and being a hardworking and friendly intern Project: Insect monitoring to determine the biomass of nocturnal insects at Laughlin Lake. Tobi: Intern From: Geißlingen Area of Study: Forest Engineering Where: University of Applied Science Weihenstephan-Triesdorf (HSWT) Role at the Conservancy: Beekeeping, photography, Rockfish conservancy Interests: biology and bionetworks, diving and marine sciences, beekeeping, GPS technology and drones, English language and culture. Lukas: Intern From: Germany Area of Study: Forestry Engineering Where: University of Applied Science Weihenstephan-Triesdorf (HSWT) Role at the Conservancy: Beekeeping, construction, forest inventory Interests: Beekeeping, fishing, carving, hiking, camping, wood carving, tree climbin Katie: Summer Student From: Calgary, AB. 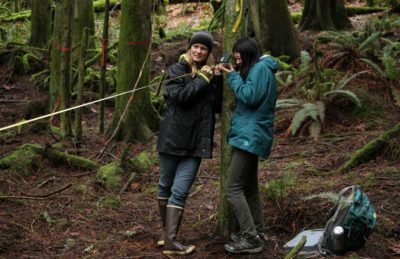 Area of Study: Marine Biology and Environmental Studies Where: University of Victoria Role at the Conservancy: Rockfish Conservation Research Assistant Interests: Anything to do with nature and being outside. Emma: Summer Student From: Nanaimo, B.C. 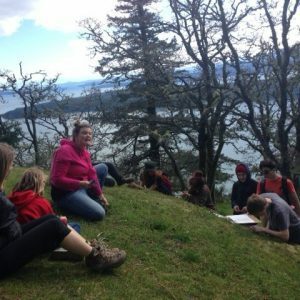 Area of Study: Fresh Water Management Where: McGill University Role at the Conservancy: Nature educator Interests: Hiking, farming, indigenous knowledge, soccer and art We look forward to meeting the Galiano community over the summer months! Posted in Stewardship Spotlight and tagged broom, interns, students.